Kryptonics offers a pretty wide variety of wheels for skateboards, with firmness ratings from soft to hard, and sizes from 55mm to 75mm. When you are trying to fine-tune your board to perform the way you want it to, you are going to have to know what you want out of your wheels. All wheels will list two important features: the size (diameter in mm) and the durometer rating (78a – 86a). The diameter factors into the acceleration and top speed of a wheel. Smaller diameters accelerate fast, but top out at lower speed: where large diameters accelerate slowly, but make a higher possible top speed. The durometer rating tells how rigid a wheel is, going from soft 78a to a hard 86a. The rigidity of the wheel is meant to work on different surfaces: softer wheels for rougher surfaces, and harder wheels for smoother surfaces. To make things easier for you, we have created our top list of best Kryptonics Skateboard Wheels and placed it right here on the homepage. 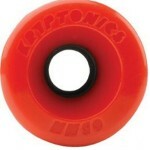 The main line of Kryptonics wheels is the Star Trac line. They are all available in 55mm/65mm/70mm/75mm sizes, and are color coded by their rigidity: red 78a, blue 82a, and green 86a. The cost of these wheels goes up with the diameter, which means that people looking for small wheels that accelerate fast will pay less, where people that want to buy larger wheels for cruising will end up paying a little more for their large wheels. Pricing is generally even among sizes, but you can find some variance based on availability. 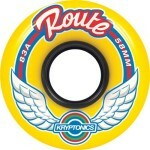 The Kryptonics Cruise series is best for the long boarder or cruiser that wants a soft wheel. 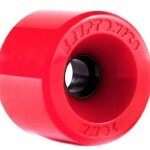 These 78a wheels come in 58mm, 62mm, 65mm, and 70mm sizes. A set of cruise wheels is a good choice for a soft wheel that will be a little cheaper than its Star Trac counterpart without sacrificing quality. 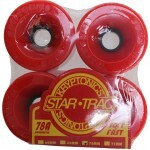 The Route line of wheels is another option for a good staple wheel for cruisers and long boarders that comes in cheaper than the Star Trac line. 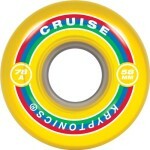 Route wheels come in the same sized as the Cruise line, but measure 83a, making them a harder wheel. Both of these lines have dual rounded edges for a smooth ride. Whether you want to have a nimble board for tricks, or a smooth ride for your cruiser, there is a Kryptonics wheel that will suit your needs. Between the three lines available, you will also be able to help the needs of your board meet the needs of your wallet.